Before shipping, your bike will be assembled by a fully qualified professional mechanic and fully setup. The bike will then be packed into a very large cardboad box. 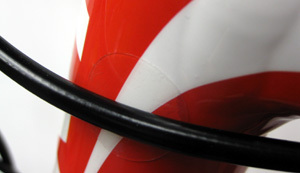 To aid shipping, the handlebars will be turned OR removed from the stem. Any pedals supplied with the bicycle will not be fitted. E-Bikes, Bicycles shipped outside of Great Britain and to Bicycles shipped to Out of Area postcodes will be packed into a smaller box and require the front wheel fitting into the fork. When you receive your bicycle you will need to carry out a few basic assembly tasks before your bicycle is ready to ride, these are explained below. We have provided details of how to carry out these procedures below but strongly recommend that if you are not confident you can do this safely that you seek assistance from a professional mechanic. It is also important you read all manuals supplied with your bicycle and understand what is required from you to maintain your bicycle's warranty. Please note: We do not provide tools with our bicycles but assembly can usually be completed with 4mm or 5mm hex keys. Occasionally, you may require different sized hex keys or Torx keys. Pedal fitting will depend on the exact pedals used but will normally require a 15mm pedal spanner, 6mm or 8mm hex key. Please contact us if you would like specific information. To allow for shipping, your handlebars may have been turned through 90 degrees. To straighten your handlebars you need to turn them so that they are aligned paralell with the centreline of the front hub (1). It is best to view this whilsts standing over the bike and looking forward and down (2). Once straightened, the two stem bolts which clamp the stem to the fork steerer need to be tightened correctly and evenly. The stem clamp bolts will normally be tightened by the use of a 5mm hex key. We recommend the use of a torque wrench to tighten the bolts to the specified torque settings. The correct torque specification can often be found written on the stem adjacent to the relevant bolts (3) (Usually expressed in Nm or kgf-cm). If the torque setting is not specified on the stem itself, please consult your manual. If you cannot find the relevant torque setting in your manual please contact us. Once each bolt is tightened to the specified torque it is important to recheck each bolt in turn as the tightening of each bolt may have slightly loosen a previously correctly torqued bolt (4). To allow for shipping, your handlebars may have been removed from the front of your bicycle's stem. To fit the handlebars into the front of the stem you will need to first remove the stem face plate, which will be held in place by 2 or 4 bolts. Once the front of the stem is open the handlebars can be put in place and the stem faceplate refitted (1). It is important that the stem face plate bolts are tightened tightened correctly and evenly. It is also important the gap between stem and stem face plate, above and below the handlebar is even (4). The stem face plate bolts will usually be tightened using a 5mm hex key. We recommend the use of a torque wrench to tighten the bolts to the specified torque settings (3). The correct torque specification can often be found written on the stem adjacent to the relevant bolt (2) (Usually expressed in Nm or kgf-cm). If the torque setting is not specified on the stem itself, please consult your manual. If you cannot find the relevant torque setting in your manual please contact us. To allow for shipping, pedals, if supplied, will not have been fitted to your bicycle. Before fitting it is important to identify the LEFT and RIGHT pedal, this is normally marked on each pedal with "L" and "R". The right hand pedal has a right hand thread (standard). The left hand pedal has a left hand thread (2). Depending on your pedal, you will need either a 15mm flat spanner, 6mm hex key or 8mm hex key to fit them (1). Before fitting the pedals into the crank arm you will need to coat the pedal's thread with anti seize or grease (3). If your bike has FSA carbon or SRAM Carbon cranks, you should have received pedal washers which fit over the pedal axle and against the face of the crank arm (4). If you think these are missing please contact us. To fit the pedals into the crank arms, thread them into the crank arm BY HAND to avoid cross threading. The right hand pedal is a standard right handed thread. Looking at the right hand side of the bike side on it will need to be turned clockwise to tighten it. Once the pedal is threaded into the crankarm it can be tightened to the specified torque setting (5). The left hand pedal is a LEFT HANDED THREAD. Looking at the left hand side of the bike side on it will need to be turned anticlockwise to tighten it. Once the pedal is threaded into the crankarm it can be tightened to the specified torque setting (6). If you have a Giant carbon bike using a D Fuse seatpost please read the more specific guidance in the section which follows this. It may seem like the most basic of tasks but adjusting your saddle to the correct height and in the correct manner is very important and not as obvious as you might think. Saddle height is a personal thing, it depends on your leg length and other physiological aspects too. Two people with the same inside leg are likely to have different "correct" saddle heights. As a starting point, saddle height should be positioned so that when the pedal is at the bottom of the stroke and the ball of your foot is on the pedal, your knee should have a slight bend in it. Hips shouldn't move sideways during crank rotation and you shouldn't have to stretch at the bottom of the pedal stroke. Forwards/backwards position of the saddle is another important factor in comfort and efficiency. With the pedals adjusted so that they are at the three o'clock and nine o'clock positions, a vertical line dropped from just behind the kneecap on the outside of the forward knee should pass through the axle of the pedal. Almost all seatposts will have a "Min. Insert" line marked on them (1), this shows than a minimum amount of seatpost must be inserted into the frame at all times to avoid damage. If your required saddle height requires this mark to show above the top of the frame's seat tube then please contact us and do not ride the bike. If there is no "Min. insert" mark on the seatpost please refer to your manual or contact us before setting your saddle height. Once your saddle position is adjusted it is very important to tighten the seatpost clamp correctly. Too tight and the seatpost or frame might be damaged, too loose and the seatpost may slip. We recommend the use of a torque wrench to tighten the bolts to the specified torque settings. The correct torque specification can often be found written on the seatpost clamp (2) (expressed in Nm or kgf-cm), next to the relevant bolt. If the torque setting is not specified on the clamp itself, please consult your manual. If you cannot find the relevant torque setting in your manual please contact us. It is particularly important to note than when tightening two bolt, opposing bolt, design clamps (as in picture 2) that you tighten each bolt, in turn, a number of times. As you tighten one bolt it effectively loosens the other so it is important you go back and forth between each bolt until both are settled at the correct torque setting (3)(4). Some frame designs do not allow the seatpost to be fully inserted into the frame, this is because frames and posts have to fit a wide range of rider heights. If your desired saddle height means that the saddle can't be lowered enough or the correct position is with the seatpost pushed into the frame until it hits an obstruction then please contact us, it is likely the seatpost will need shortening. Never ride a bicycle with the bottom of the seatpost touching the frame. If your frame is made of carbon fibre or has a carbon fibre seatpost it will have been assembled with carbon assembly gel, this paste feels gritty to the touch and is vital to stop your seatpost from slipping or seizing into the frame. If your frame is made of metal and the seatpost is metal too it would have been assembled with an anti seize compound between the two, this prevent seizing. To achieve the correct clamping force and prevent damage to the frame and seatpost particular care has to be taken to the assembly of the clamp. We highly recommend using a torque wrench and a long reach Allen key bit or an extension bar which enables good access to the clamp bolt without fouling against the seatpost (1). We do not recommend using small multi tools for this task as they can damage the hex bolt and mark the seatpost. To adjust your saddle height, slacken off the clamp bolt until you can see the bolt head rising from the clamp. Then pull up on the saddle, it may be necessary to wiggle the seatpost from side to side to release the tension between the clamp and the post. If you require the saddle lowering, firstly, pull the seatpost up with the clamp and apply a carbon assembly gel to the new area of the seatpost that will be in frame and in contact with the clamp (2). Once you have the seatpost to the correct position, firmly press down on the clamp bolt head with the Allen key to ensure the clamp is sat correctly in the frame. The clamp must be flush with the toptube (3) and NOT as seen in picture 4. Torque the clamp to 6Nm. Lastly, wipe off any excess gel and push the rubber cover over the clamp (5) ensuring the plug sits in the bolt head. As you use your bicycle the gear cables and brake cables/hose will likely come into contact with your frame. This can lead to cosmetic damage or if left unchecked, in extreme circumstances, structural damage. To guard against this, it is sensible to place clear anti rub patches anywhere this might happen. Most of the bicycles we supply come with a selection of patches for you to apply. These aren't applied at the factory because until your final handlebar position is set, it is hard to know where the cable may rub. There is also a balance to be struck between the cosmetic effect of placing sticky patches all over your bike and protecting it. It is your responsibility to fit protective patches where you see fit. As part of your regular maintenance routine you need to check under all cable/frame junctions for paint wear and fit protective patches where appropriate. 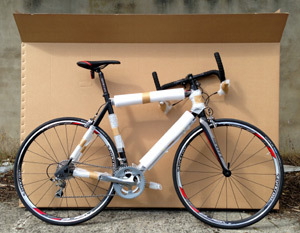 Over years of shipping bikes we have developed our packaging to deliver your bicycle in the best condition possible. However, we recommend checking your rear derailleur's alignment before riding your bicycle incase it has been knocked during transit. It is also imperative that the alignment of this part is checked as part of your pre ride checks, after storage, rear wheel removal, transportation and accidents. Your bicycle is fitted with a breakaway gear hanger which is designed to fail in the event of a crash, therefore reducing the chance of damage to the bicycle's frame. By design, this part is relatively weak and is vulnerable to misalignment. 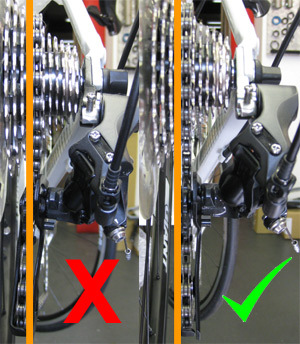 Misalignment of this part may cause your rear derailleur to catch the rear wheel and result in an accident or damage. It is imperative that the alignment of this part is checked as part of your pre ride checks, after storage, rear wheel removal, transportation and accidents. Your bicycle should never be stored with the rear derailleur leant against anything or sat on the rear derailleur with the rear wheel removed. The correct alignment for this part is for the rear derailleur cage to be in the same vertical plane as the rear wheel and not touching the spokes when in the large sprocket (low gear). When you get your new bike you probably just want to get out there and ride. Please take a few minutes to read through the owner's manual for your new bike, there's important information in there about what you need to do to use the bike safely and keep it running safely too. If you have ordered a bicycle which uses Shimano's Di2 electronic shifting system please read this information. If your bike has been supplied in a small box with the front wheel removed because you live out of area or outside of GB you will need to connect the battery cable before inserting the seatpost into the frame. Release the end of the Di2 cable which will be retained on the top tube of the bike to stop it falling into the seat tube (1). IMPORTANT, do not pull this cable with anything more than light pressure or it may become unplugged inside the frame. Firmly push the end of the cable into the battery which is housed in the seatpost (2) remembering not to pull the cable too tight. You can now fit the seatpost taking care not to pinch the cable. We charge all Di2 batteries before shipping so you should not need to charge the system before use. Your bike will be supplied with a Di2 charger (3) which features a USB plug and a Di2 specific plug which connects to the under stem or bar end junction port. When connected and charging the two charger lights will display differently depending on the system status (a & b). The junction box mode light (d) may illuminate at the end of the battery check, this reflects the shift mode of the system. Pressing the junction box mode select button (5) is used to adjust the gears. This is only recommended for Advanced users who have consulted the instructions.